A reminder that some people should be careful what they wish for. For example, buried in ‘other products made with Oil’ we find fertilizers, which have greatly boosted world food production. Use Control + to enlarge. I would love a copy of that to use as a poster on our church notice board. “Cleaning products; all those products you can’t pronounce in the ingredients list, all of which are very poisonous” – which idiot wrote that? And I notice breat implants are made from oil – I thought silicone was involved but apparently not (according to these idiots). Medicine: Most over the counter medications, HOMEOPATHIC products, and vitamins are derived from benzine….It is spelt benzene you idiots, and it isn’t used to make vitamins and probably very few, if any, medications. I will let the believers in homeopathy answer for their products – once they stop rolling on the floor laughing. Cosmetics: most produced with the help of petrochemicals??? Well, if you include petrol and/or diesel for the delivery vans I suppose. I don’t know who wrote this garbage but I hope that they weren’t given a pass mark in the first year of high school Chemistry class – Year 7 – because they didn’t deserve it. Meeting the world’s escalating food needs cannot be achieved without fertilizer input. Sans fertilizer, the world would produce only about half as much staple foods and more forested lands would have to be put into production (Roberts, 2009, Better Crops). Inorganic commercial fertilizer plays a critical role in the world’s food security and is important from both the yield and food quality perspectives. INORGANIC fertilzers aren’t made from ORGANIC petroleum. Is this your idea of a joke? When oil prices start climbing above $150 we ought to see it getting replaced by something else. Or the poor will make do with less. INORGANIC fertilizers aren’t made from ORGANIC petroleum. Is this your idea of a joke? inorganic fertilizers are synthetic and typically made from petroleum. You are mixing the 2 types. That statement is bull sh*t and contradicted further down that same web page. Phosphate types of fertilizer are based on mining rock phosphate mostly old deposits of sea bird guano. Superphosphate is that treated with sulphuric acid to improve solubility. Potassium is mined, mostly as the chloride. Ammonia is made from hydrogen and nitrogen, and nitrates are from oxidised ammonia. Nor does the poster allow for the products extracted or synthesized from coal. Chemicals from Coal were more prevalent than those from petroleum until 1951. And what of those made from natural gas? As for antibiotics made from petroleum name one. It is far easier (and cheaper) to get fungi and other organisms to make them. Penicillin didn’t come from oil. A lot of detergents have a natural base modified by ethylene/propylene oxide. Some are synthetic. While the makers of the poster wanted to show how necessary oil is in our modern world, there efforts will have less effect if riddled with inaccuracies and likely to be dismissed by the ignorant anyway. Synthetic Fertilizers are “Man made” inorganic compounds – usually derived from by-products of the petroleum industry. Examples are Ammonium Nitrate, Ammonium Phosphate, Superphosphate, and Potassium Sulfate. These chemicals, many of which were developed in the lab and are petroleum-based, have allowed farmers and gardeners of every stripe to exercise greater control over the plants they want to grow by enriching the immediate environment and warding off pests. Inorganic or synthetic fertilizers refine nutrients from inorganic sources, such as rocks, petroleum or from organic substances. Bear in mind the poster doesn’t claim to be a comprehensive list – ‘a few other products…’. oldbrew, this organic/inorganic argument could go on for ever without being resolved. A geologist friend explained to me last night that there are two camps on this the main one holding that crude oil is organic because of the hydrocarbons (carbon and hydrogen being organic), while another group point to the minerals included and say that it isn’t organic. My friend says he is sitting on the fence and I agree with him because it appears that most of the argument is about semantics and qualifying definitions. In the mean time civilisation would be in a bad way without the spin off products from crude oil and coal. Welcome to the world of Internet Disinformation. And I gave up on The Scientific American as a source of reliable information some time in the 1980’s. As I pointed out ammonia is made from hydrogen and nitrogen from air. Hydrogen can be obtained from water (the intermittent electrolysis approach beloved by Greens who know no practicality and never consider cost). In practice it is made by steam reforming of methane (from natural gas) so you are stretching the definition in saying it is “from by-products of the petroleum industry”. Ammonia is oxidised (with air) to make nitrates, also used in making explosives. The previous source of nitrates was minerals mined in Chile and unavailable for Germany in WW1, hence Haber developed the process. Superphosphate is rock phosphate which is mined and treated with sulphuric acid to make it more readily soluble (the calcium sulphate dissolves faster than the calcium phosphate and leaves more surface area exposed to weathering). Sulphuric acid is made from sulphur which is mined as that and oxidised. The only part petrochemicals play is as fuel (to make steam) and for transport vehicles. If petroleum became unavailable (which I don’t think likely) then most of the petrochemicals would be made from coal and natural gas. As Ivan notes the difference is hard to discern; Organic farming uses manure and compost etc. which breaks (or is broken down by bacteria, moulds and animals) to inorganic chemicals which are water soluble and thus available to plant roots. Hydroponics depends on inorganic chemicals which are water soluble and thus….. (and I have used hydroponics on a minor scale since the 1980’s). I think we can drop the debate there. The old “OIL WILL RUN OUT REAL SOON” scare. Yes, it would be better if we stopped burning oil and coal and used them as raw materials for chemicals. Unfortunately mankind wants to keep eating and be warm and comfortable, and switching to nuclear energy is blocked by hysterics from the very people who believe the other scares. The use of petroleum based chemicals often comes down to cost and convenience as alternative sources haven’t been developed or have been abandoned. I once was involved in making a polyurethane mostly from castor oil. A lot of waxes are still extracted from plants or animal fats. A lot of chemicals can be, and are, made from coal or natural gas. One thing is certain modern civilization cannot rely on sunlight and wind. 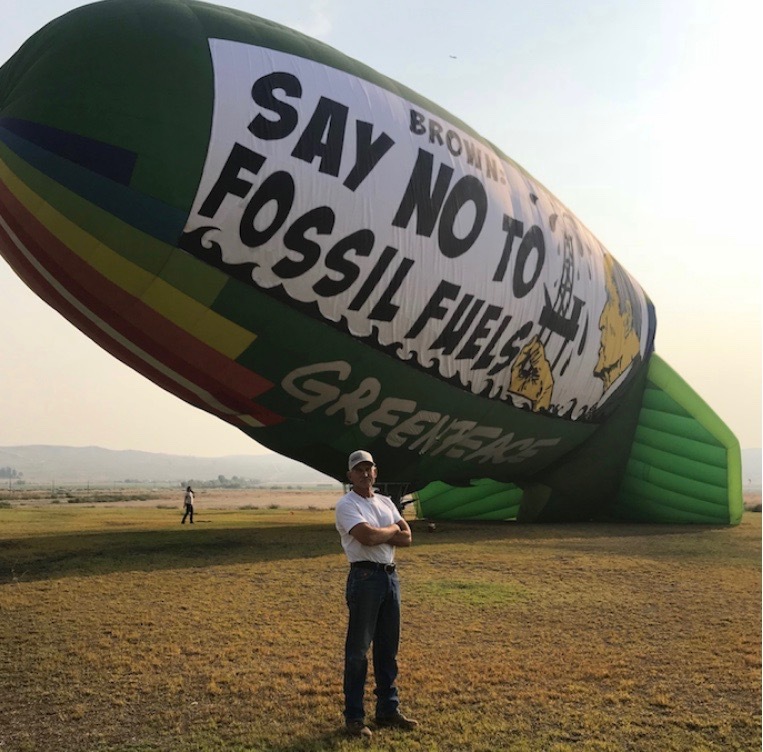 Early Monday morning, radical activist group Greenpeace launched an ill-conceived stunt over the Taft-Kern County Airport in Taft, Calif. in the form of a…dirigible. Yes, Taft is a town that literally exists because of oil production. And, yes, the blimp is powered by propane and made of petroleum-based polyester. Yes, the tires, O-rings and controls of the airship are made of petroleum-based rubber and plastic. Greenpeace isn’t much for optics, it seems. Upon arrival, Mayor Noerr [pictured] asked: “What powers this thing? Is that propane?” highlighting the irony of using a large, fossil fuel-powered, petroleum-based polyester airship to protest the production of fossil fuels. There is invariably a very close link between energy consumption and the standard of living. South Korea is now very prosperous and consumes about twice the energy per capita as does the UK. There are two particular commodities that enable us to support this arrangement, with a minority of workers supporting a large number of non-producers. They are oil and electricity. Until twenty years ago, coal might have been included, but its role is very much reduced in the UK, but not everywhere.